When she was alive, I certainly couldn’t picture the lady in long skirt and feathered hat with a shotgun over her shoulder – whistling up the bird dogs, mounting her horse and galloping off through fields of cotton. Such images and random tales of a bygone era are the stuff that invite us to contemplate our ties to the past and awaken us to the present. 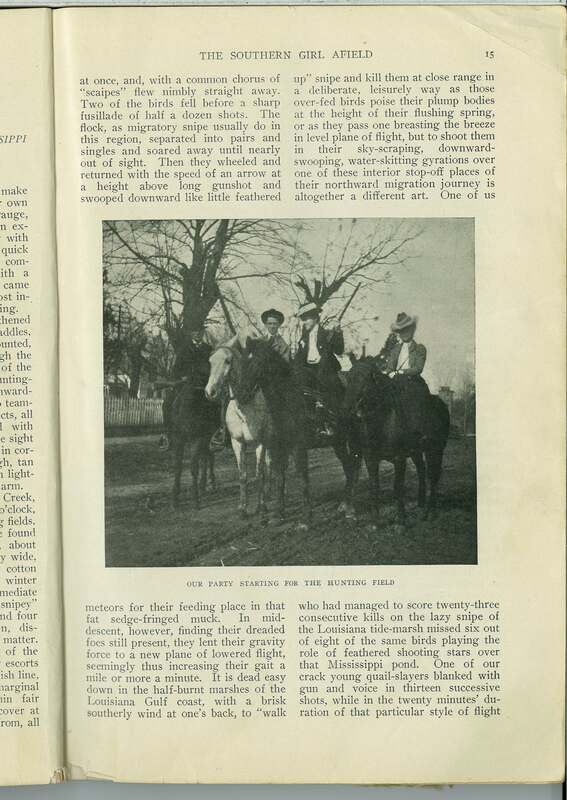 Or so it seems, as I pull from my home library collection a very tattered but cherished issue of Field and Stream from the year 1903 and reread an article about a remarkable lady: the late Georgie Willson Newell from Natchez. This entry was posted in Profiles and tagged Field and Stream 1903,. Bookmark the permalink.